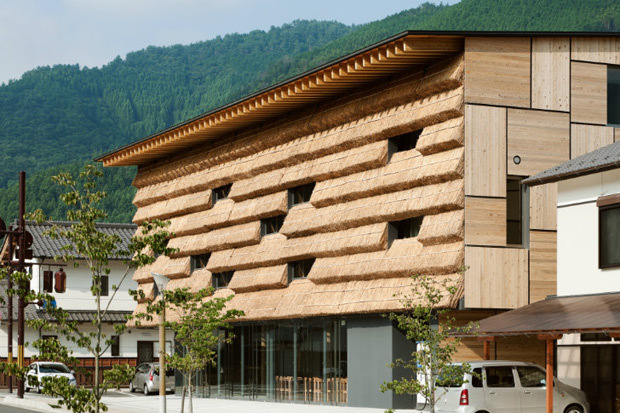 Two things stand out deeply when Kengo Kuma approaches the work of the Japanese arquitectos. On the one hand the great quantity of projects that he has constructed in the last 10 years, all of them of the highest level, on the other hand such a radical use of the materials, or if it is preferred of the matter, as an element of continuity between the past, the present and the future of the architecture. 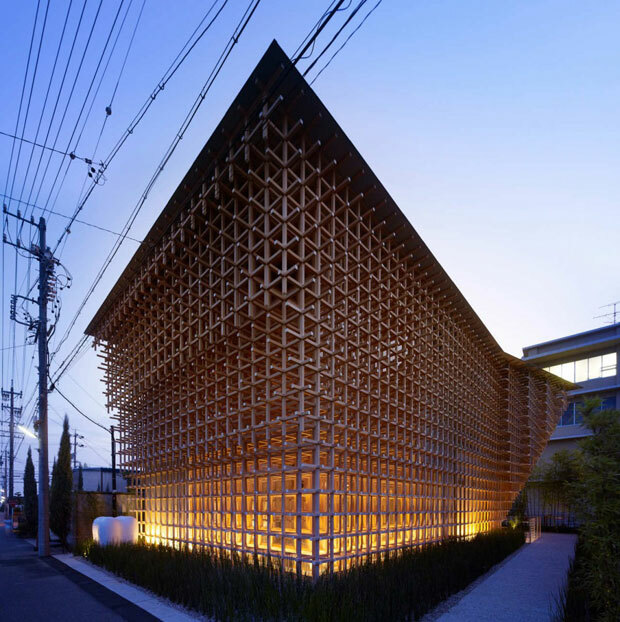 It is not a chance that to Kengo Kuma, many texts and investigators have placed the nickname of the architect of the matter. A lot of works of Kuma’s study do an effort for taking the material to a step in the one that acquires all the protagonism, both formal and expressive, but always fighting to add to the context in which one agrees the building. It is a constant in his work the use of the typical materials of a certain region or of the constructive traditional technologies of a people for the construction of a contemporary building in this region. A good example of this obsession for the local matter is the Museum in Yusuhara. The project can summarize as the construction of a building bridge, which will join two public ancient buildings that for a long time were separated by a road. Hereby, the existing museums will communicate and will fuse in an only one great building that will multiply his functions and his cultural offer. Provided that this connection in bridge was necessary, Kuma chose to provide it with content, thus the bridge does not work only as a passage between two existing facilities, but also it shelters housings and a workshop, definitively a place of temporary residence for artists. Instead of a structural waste of steel and glass, one proposed a structure that with small advances in projecting was gaining little by little the distance that separates both former buildings. 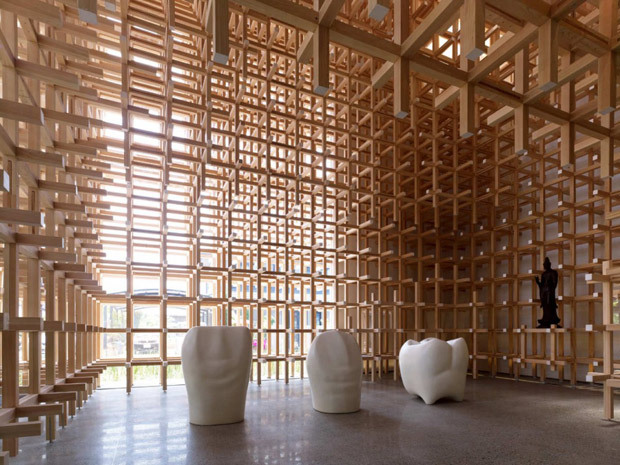 The structural system, which consists of hundreds of small pieces, does a clear allusion to the structures of projecting developed often in the traditional architecture of China and Japan. Somehow this structure claims a sustainable design, in a place of mountain in which the transport is very expensive, solves the question of how it is possible to achieve a great bridge across the sum and lace of small units of wood, avoiding the use and movement of big elements of construction. This project of the bridge resembles to a great extent the Museum and Center of Investigation GC Prostho constructed by Kuma’s office 5 years before. The whole project originates in the system Cidori, a Japanese game of traditional construction. The Cidori is a set of articulated sticks of wood that has the only form, which allows them to join and to form spatial groups only turning them, without need to use nails or metallic elements. The traditional toy has come to the new generations thanks to the work of hundreds of craftsmen who at present continue making it. By means of a collaboration with the structural engineer of the project, Jun Sato, which carried out tests of compression and flexion to verify the capacity of the system, there was verified that the same device of the infantile toy could be adapted to the big contemporary buildings. Multiplying the size of the pieces of the game the totality of the building was constructed, creating an architecture which universe arises by means of the combination of small units and his repetition. 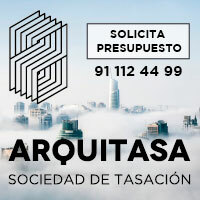 This project defends in addition an ideological position, that one in which the traditional ingenuity can compete in the age of the technology in equality of conditions and to demonstrate with the construction of the building that technology and tradition are not faced to the needs of the modernity. The Yusuhara Marche is one of Kuma’s last projects. The building shelters a market of local products, and a small hotel of 15 rooms, which remain communicated across a porch. The principal street of the municipality in the one that places the building, is a tourist very important destination in the region, and precisely to this fact there owes the existence of great quantity of “Chad Do” traditional, a few places with cover of straw that services offer to the travelers, such as housing, food or cultural events and in which there is served tea of free form. 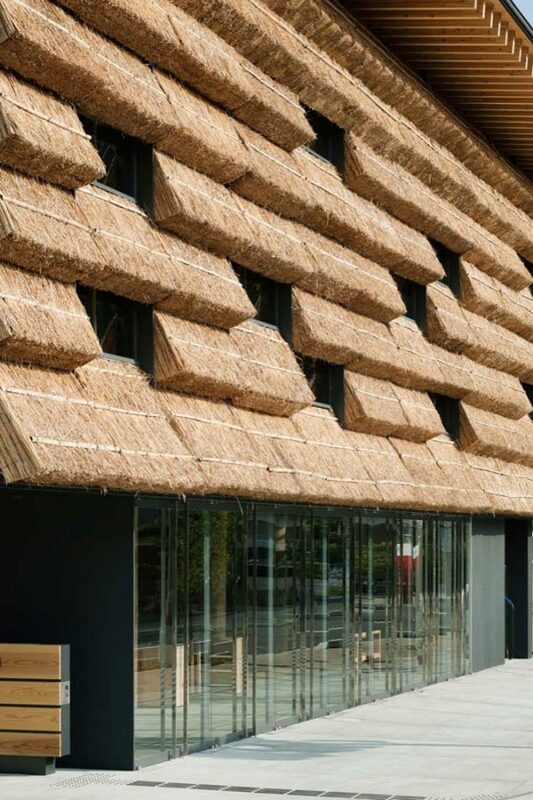 As an attempt of respecting the local history, the architects used the traditional as material straw; since his use is very established in the covers of the existing buildings in the street and his use could be a good way to connect the past with the present. The cover of traditional straw is reinvented in the building to propose a front that improves the conditions of the wall glass curtain, sifting the light and that close to the local cedar in the testeros produces an image that he speaks about modernity while he talks with the context. Interrogated in occasions for the autoimposition of the strict use of a certain type of wood for a concrete work, Kuma makes clear that the Japanese carpenters always have used in his works the local wood, which grows in the same climate. From his vision it is the most reasonable and most logical thing, the dampness and the temperature alter the wood, which also gets damaged in the transport. From this optics, the wood of a place lasts more in this place and in addition it is more economic. This methodology might be labelled therefore of sustainable, balanced and logical. These Kengo Kuma’s works, beyond his volumetric effects or his formal risks, serve us to think about a trend that seems to have been implanted in the company of current consumption and that seems to prioritize the distant and sophisticated thing opposite to the local thing and the simple thing, defending in cause the absurd thing opposite to the exact thing and the reasonable thing.